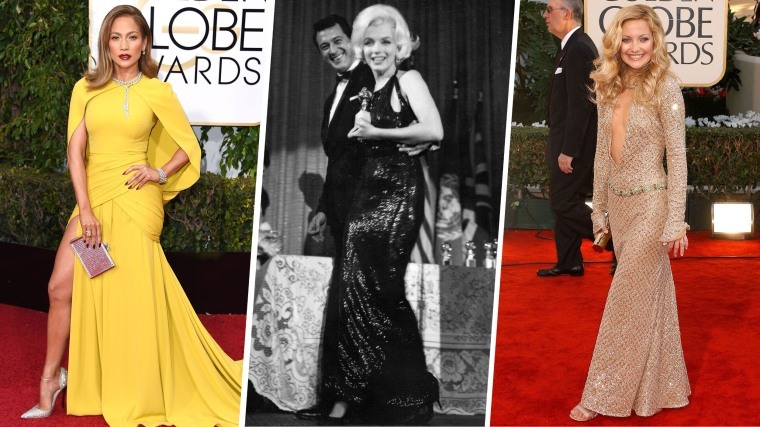 Golden Globes 75th anniversary: Who was the best dressed? The Golden Globes are turning 75! Which red carpet look is your favorite? From Marilyn Monroe in 1962 to Jennifer Lopez in 2016, vote for your favorite Golden Globes red carpet look. The Golden Globes are turning 75! In honor of this milestone, TODAY is taking a look back at some of the most memorable red carpet gowns. From Marilyn Monroe in 1962 to Jennifer Lopez in 2016, stars have lit up the red carpet through the years. TODAY wants to know which celebrity look YOU think was the most showstopping, unforgettable and gorgeous of all. What's your favorite Golden Globes red carpet moment? Take a look below and vote for your favorite, then watch NBC's "Golden Globes 75th Anniversary Special" on Wednesday, Dec. 13 at 9 p.m. EST to see the results! Marilyn Monroe won the Golden Globe Henrietta Award for World Film Favorites in 1962. Marilyn Monroe's emerald green sequined gown by Norman Norell is one of the most iconic looks of all time and has inspired many stars' red carpet choices through the years. Kate Hudson's bedazzled Versace gown with a plunging neckline was a true showstopper. She completed the look with soft, retro waves and peach-y makeup. Sarah Jessica Parker took her character Carrie Bradshaw with her on red carpet in this look. This charcoal gown had a sweetheart neckline and sparkly high-low skirt. In true Bradshaw style, she paired it with teal satin pumps for a real fashion statement. Eve Mendes glowed in this white Dior strapless gown with an oversized bustle at the waist. She completed the look with a chic updo and bold turquoise statement necklace from Van Cleef & Arpels. Angelina Jolie was gorgeous in green for at the 68th annual Golden Globes red carpet. This long-sleeved, shimmery Versace gown was encrusted in Swarovski crystals for extra sparkle. Plus, the bold hue made her green eyes really pop! A beautiful blowout was all she needed to complete the look. Sofia Vergara stunned in this regal, navy blue Vera Wang gown with a mermaid shape that showed off her gorgeous figure. It was all about the details with this dress, which was covered in eye-catching and intricate pleating. A sleek hairstyle, dangling earrings and bold cuff bracelet pulled it all together. Charlize Theron had all eyes on her in this pale pink Dior gown. The thigh-high slit, bustle at the waistline and plunging neckline created a look to remember. A bedazzled headband and side-swept bun added a sweet touch to this glam ensemble. Lupita Nyong'o was gorgeous in cherry red in this column gown from Ralph Lauren. The off-the-shoulder dress had a flowing cape that was made for a standout red carpet moment. And it certainly was! Jane Fonda looked radiant in this long-sleeved, hip-hugging gown. The Versace dress featured sheer, cut-out details with embellishments fit for a long-time star. Fonda accessorized her outfit with shimmery shoes, a matching red clutch and chandelier earrings. There was nothing mellow about Jennifer Lopez's head-turning yellow gown. The actress and singer rocked this Giambattista Valli gown that included a cape and classic J.Lo thigh-high slit. Stunning diamond jewelry, sparkly shoes and a bold red lip made this look the epitome of glamorous.